Over the July 4th weekend I was at the Lake Apopka Wildlife Drive. It wasn’t crowded that day, so I got to linger and go as slowly as I liked. I began to hear the repetitive call of baby birds. 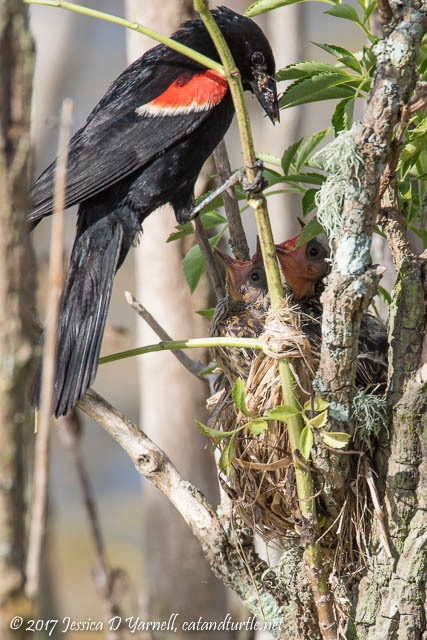 I looked left, I looked right…and then I looked down and saw this little Red-winged Blackbird hanging out of his nest! 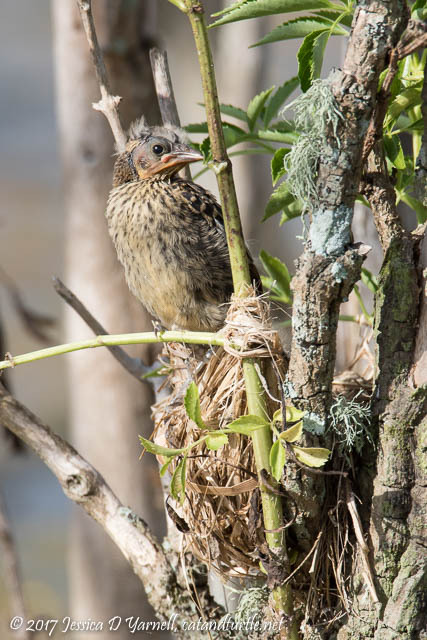 This little bird was ready to fledge. He stood on the side of his nest, flapping his wings, thinking about taking that big plunge. Mom sat nearby, calling to him and encouraging him. But it’s a scary thing for a little bird to fly for the first time. 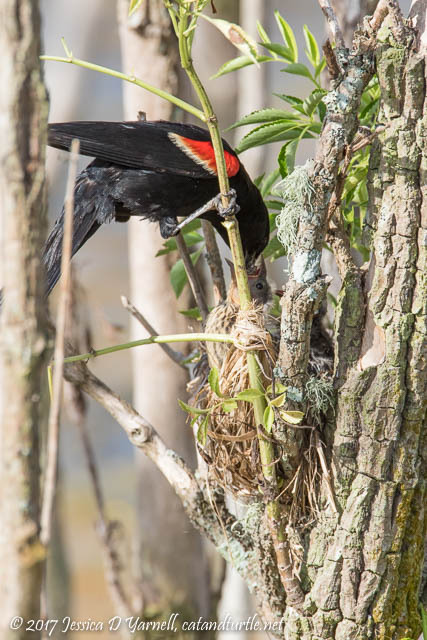 It’s easier for him to wait in his nest and have Mom bring him his food. After watching for a few minutes, I saw that Junior wasn’t alone in his nest. He had a little brother in there, too. Both birds became quite animated when Dad flew by. Dad carefully placed a bite of lunch into each beak. The babies were good and didn’t fight over it. 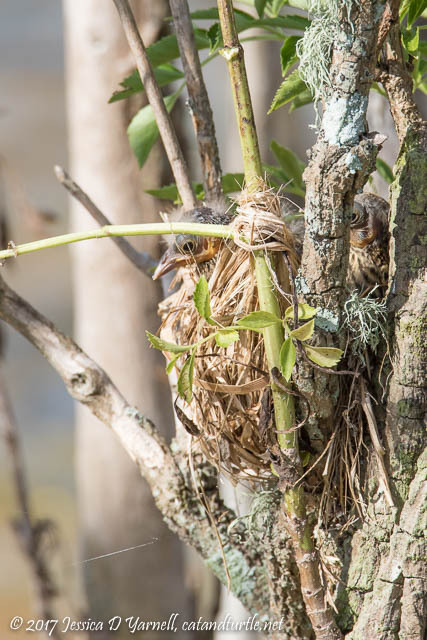 They co-existed peacefully in that little nest, unlike most baby birds that I’ve observed. After Dad left, the babies settled down into their nest. You can just barely see two little eyes and a beak sticking out over the branches. There they stayed until I drove off. I so enjoyed my time with this little family. But when I went back the next day, the nest was empty. 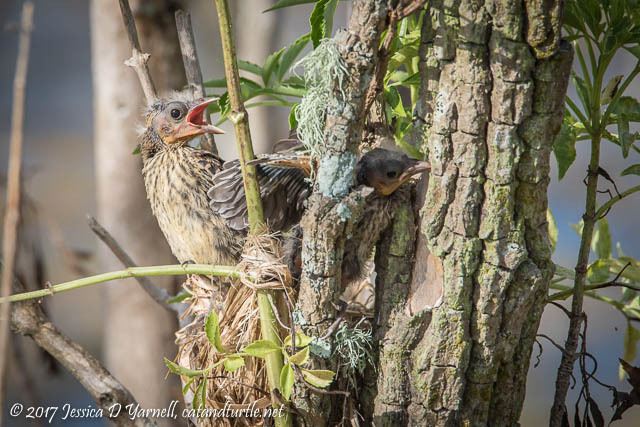 I’m sure these little guys have joined the dozens of other fledglings who are growing up around the Lake Apopka Wildlife Drive. 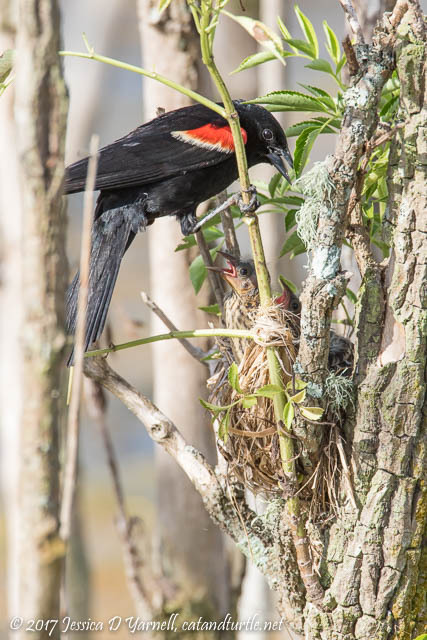 Nests with babies are my favorite. Such great interactions, I never get bored with them!